Turkey’s Mediterranean Region enjoys a friendly climate characterized by damp winters and hot summers, though it can get flooded in some areas during the spring and summer rains. Narrow valleys lie between steep peaks, and beyond them vast plains are perfect for farming. The Mediterranean Region is also a vital tourist destination, its natural beauty matched by its impressive historical sites. In the province of Isparta, beautiful rose gardens and sparkling lakes dot the land and the legendary Temple of Apollo, the Baths, Saint Paul's Basilica, and an ancient theatre stand in the city of Antiocheia. The province of Antalya faces the Gulf of Antalya and is a popular vacation destination, with its holiday villages and resorts with hotels, palm-lined streets and the attractive docks. If you want to get a glimpse and feel of early Turkish communities, another must-visit spot is Kaleici, a town of narrow winding roads and aged timber houses. In the last few decades, many Germans and Russians have bought holiday and retirement homes here. Antalya, known as Attalia in antiquity, lies in the Mediterranean region in Turkey. It has been settled since the Middle Palaeolithic Era, and the ruins of ancient cities can be found throughout its territory. The region has become a popular tourist destination for its culture, history, and natural beauty. 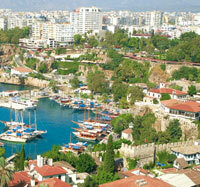 Antalya, the provincial capital, lies on coastal cliffs and surrounded by mountains. Its historic centre is Kaleiçi, now a vital commercial area with hotels, restaurants, gift shops, bars, and clubs lining the cobbled streets, alongside old Greek and Turkish houses. Historic monuments here include Hadrian’s Gate, the last surviving gate built into the city’s defensive walls, built in 130 AD; the Broken Minaret, a Byzantine church converted into a mosque; the Fluted Minaret, the symbol of the city built by the Seljuk and adorned with turquoise and dark blue tiles; and the Hellenistic Hıdırlık Tower. Historic sites and buildings have also survived in other cities. The 2nd century theatre in Aspendos is one of the best-preserved structures in Anatolia. Side has the largest theatre in the region, the Temple of Apollo, an agora, fountains, and baths turned into a museum. Perge, founded by the Hittites, has a theatre, a stadium, an agora, and baths from the Roman Period. The sacred cities of Xanthus and Letoon have important ruins as well. 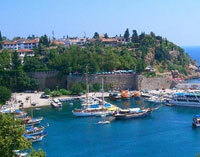 Antalya has many holiday resort towns. Kemer, along the Mediterranean, has coastal villages, a lively yacht marina, restaurants, markets, and bars. Most beaches here are pebbled and rocky, except for a sandy one near the marina. The town holds a colourful carnival every April. From Kemer, one can explore ancient villages on the Mediterranean coast, such as Olimpos, which has tree-house camps popular to backpackers; the sacred Çirali, surrounded by bay forests; and Phaselis, a port city with many natural coves. Alanya, once the vacation capital of the Seljuk State, is now an urbanized resort town with soft sand beaches, hotels and holiday villages. 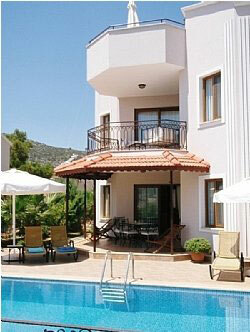 Kalkan has a beautiful marina, and several hotels built in the European Renaissance style. It has Turkey’s longest and widest beach, the stunning Patara Beach, which is still undeveloped and peaceful. Verdant Belek, nestling in pine forests, has modern holiday complexes and an international standard golf course. The charming orange-grove county of Finike is near Demre, where Saint Nicholas is said to have lived and died. Saklikent is a popular winter sports resort in the Beydağı Mountains. Other attractions in Antalya are the Upper and Lower Düden Waterfalls, which plunge into the sea near the long and sandy Lara Beach. The pebbly Konyaalti Beach to the west has many pricey and stylish bars and becomes overcrowded during peak season. The Gülluk Mountain National Park in the ancient city of Termessos is also worth seeing. It includes Karain Cave, which was first occupied by humans in the Palaeolithic Age; it was the first settlement in Turkey. The large city of Adana lies on the Çukurova Plain at the foot of Taurus Mountains. It is the commercial capital of the eastern Mediterranean Region, and fast growing in the agro-industrial sector. It produces large quantities of cotton, rice, wheat, barley, corn, berries, and citrus fruits. It is also a major player in the textile manufacturing, wool processing and leather tanning industries. The bustling city has several attractions, such as the Roman mosaic art in the ancient cities of Anavarza and Misis, the Stone Bridge over Seyhan River, built by Emperor Hadrian, and two 16th century mosques. The towns of Karataş and Yumurtalık are known for their beaches. The joint Turkish-US air force facility, Incirlik Air Base, can be found east of Adana. It has a street bazaar selling second-hand goods.